After a thorough renovation and completing a rigorous review process with ZeroEnergy Design acting as Certified Passive House Consultant, Ellis Passivhaus in Chicago becomes the first Passive House Institute certified home in Illinois. In a major development for the Great Lakes region and the City of Chicago, the Passive House Institute (PHI) has certified its first building in the State of Illinois, Ellis Passivhaus. This completes a process that holds the builder to one of the most rigorous energy efficiency standards in the world. Ellis Passivhaus, a development of Kenwood Construction Services with the Passive House consulting services of ZeroEnergy Design, transformed an antiquated 1890’s rowhome into a progressive, urban, green living environment. The newly renovated building demonstrates that families who desire a green home within city limits are not limited by building age, and do not need to compromise on style, space or comfort. 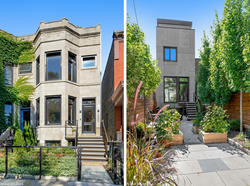 The home provides exceptional energy performance, healthy indoor air quality, thermal comfort, and long term resilience, all within a Chicago row house aesthetic. The PHI certified, all-electric home consumes approximately 90% less energy than a similar code-built house. With the planned installation of solar panels, the Ellis Passivhaus is anticipated to be net zero energy, producing as much energy as it consumes annually. The thick walls and roofs lack thermal bridging, the continuous air barrier yields minimal leakage, while high performance, triple-glazed windows round out the super-insulated building envelope. An air source heat pump and an energy recovery ventilator ensure that the house stays warm in the winter, cool in the summer, and provide a constant supply of fresh, clean air throughout the year. A heat pump hot water heater, Energy Star appliances, induction cooking complete the high-efficiency package. The home's impressive energy performance is not only a sustainable addition to a taxed environment, but also offers shelter from future heating & cooling costs, superior thermal comfort, and with future adequate solar installed, could yield enough energy to support an electric car. “To have meaningful carbon reduction we are going to have to address energy usage by buildings. According to the City of Chicago, 73% of carbon dioxide is created by inefficient buildings. PHI directly addresses this challenge. It is an honor to be certified by this organization and we look forward to building many more Passivhaus buildings in Chicago”, said Michael Conners, founder and CEO of Kenwood Construction Services. The team of professionals responsible for the project includes Kenwood Construction Services for construction and development, ZeroEnergy Design for Passive House consulting and mechanical design, Richard Kasemsarn for architecture, and Elizabeth Harper for photography.